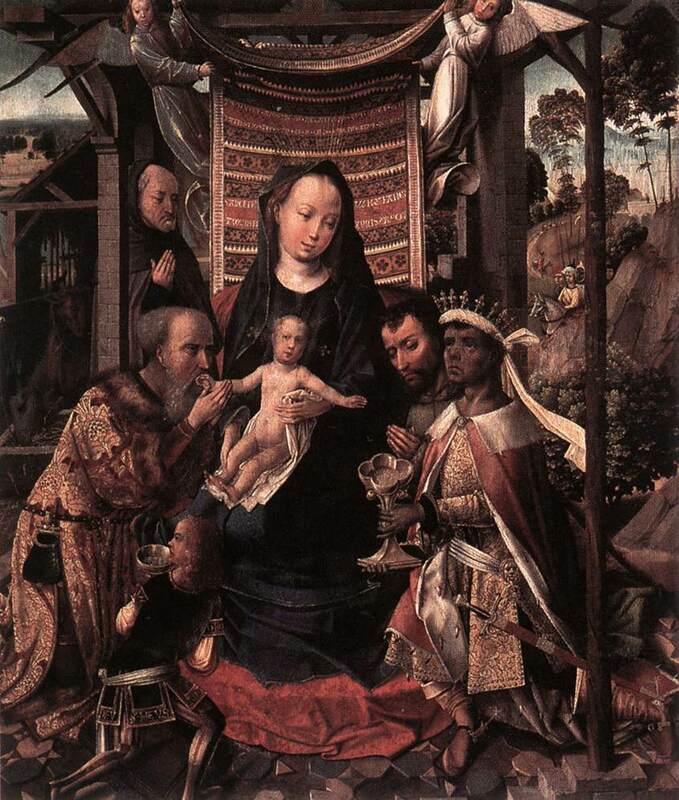 The Child Jesus is worshipped by Mary and Joseph, by shepherds and angels…and also by sumptuous characters, the Magi. In the earliest depictions, the magi are astrologers from Persia or Babylonia who study the stars and who are dressed in oriental clothes with belted tunics, trousers and Phrygian caps (S. Apollinare, Ravenna). As good Orientals, they bow down in front of the Child and they bring offerings in their veiled hands. Since there are three gifts, gold, myrrh and frankincense, their number was soon fixed at three. And as the name of magi is pejorative, their caps have become crowns and the learned magi have become powerful kings. Only the star is always present, most of the time it is a six-pointed star. There remains to differentiate between these kings since the magi had the same faces. As they are three (though only two in the mosaic of S. Maria Maggiore in Rome) they can represent the three ages of life, youth, maturity and old age but also the three continents known before the Great Discoveries, Europe, Asia and Africa, which is an invitation to portray a black king. The only thing left is to give them the names found in the Apocryphal gospels, Melchior, Gaspar and Balthazar, to make their gifts more and more sumptuous, to remove the veiled hands and to multiply servants, retinues and caravans…We arrive at the magnificent Renaissance adorations in which the Oriental prostration is replaced by the genuflexion of the first king, the oldest one, who kisses the foot of Jesus, a true infant king carried by his mother. This scene is an Epiphany, which in Greek is an apparition or manifestation of God, like the baptism of Christ or the Transfiguration, but the name Epiphany has remained linked to this episode. 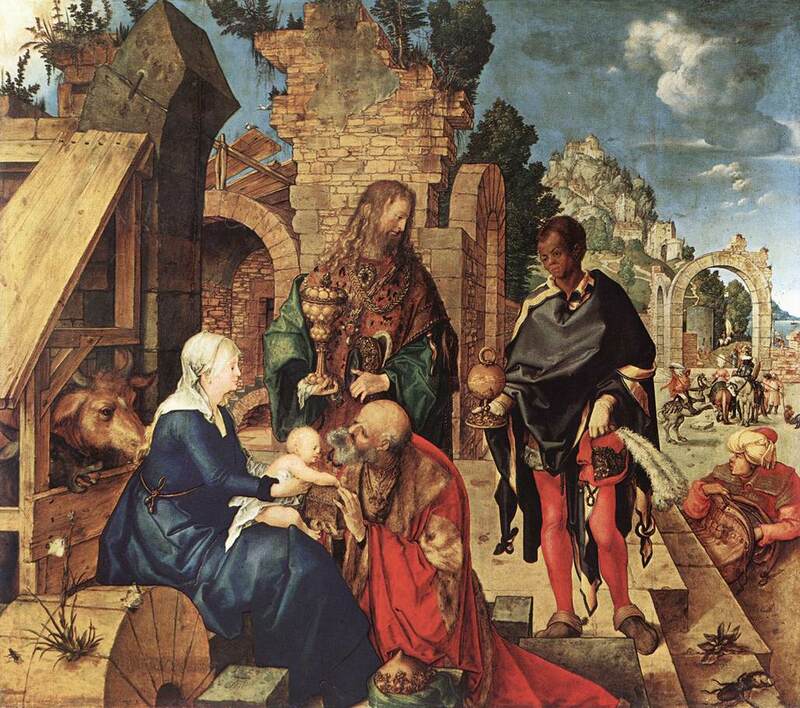 The magi being pagans coming to worship the “king of the Jews”, the narrative shows at the same time the recognition of the Messiah and His manifestation to the pagan world. The offerings have a meaning in relation to Jesus: gold is the emblem of kingship, frankincense is used to honour the deity and myrrh is used for embalming. Some elements are still quite uncertain, in particular the number of magi or kings. 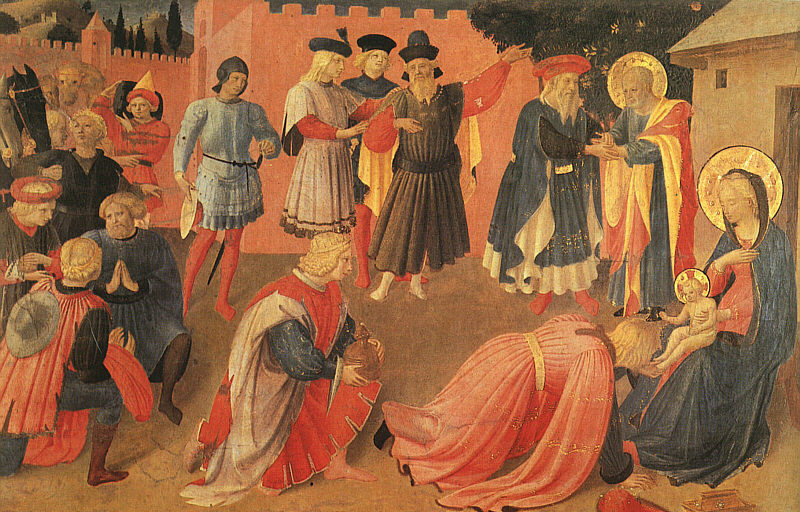 Those of Fra Angelico have no crowns and Bartolo di Fredi has painted four magi. 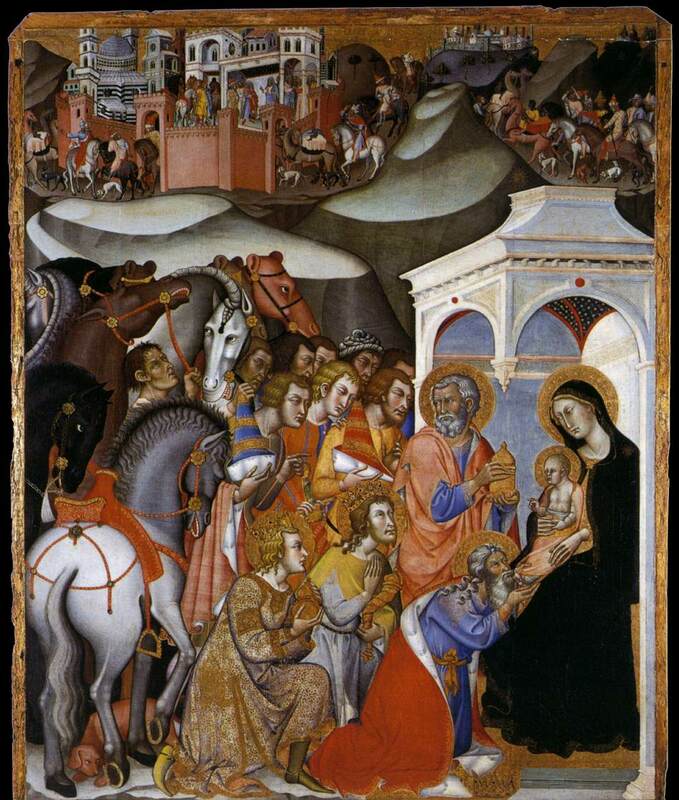 The Adoration of the Magi; Fra ANGELICO, 1433; tempera on panel, Museo di San Marco, Florence. 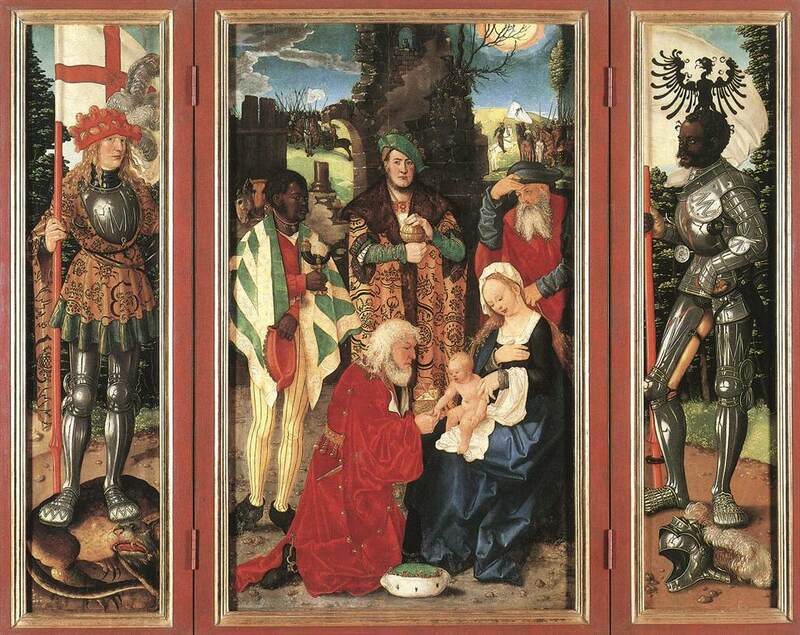 The three magi represent the three ages of life. 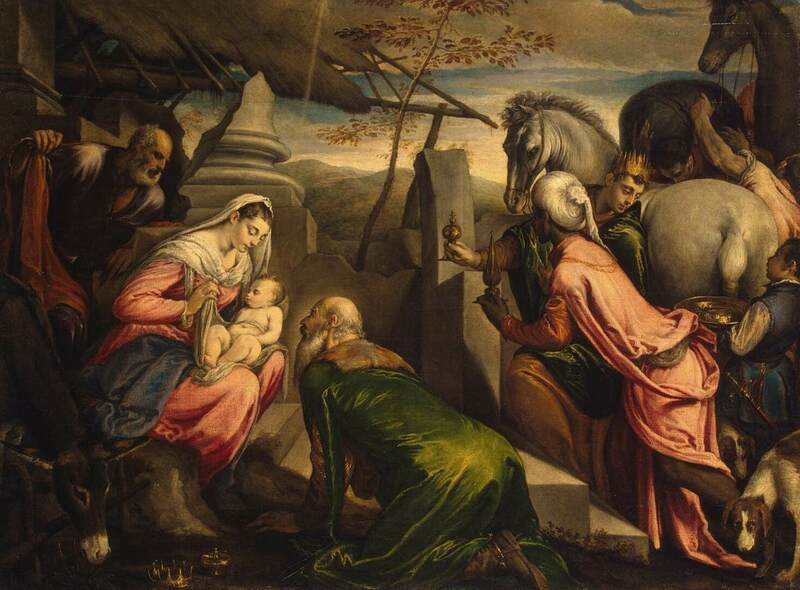 The Adoration of the Magi; Jacob BASSANO; 1562; oil on canvas; Kunsthistorisches Museum, Vienna. or the three traditional continents, Europe, Asia and Africa; hence the black king. 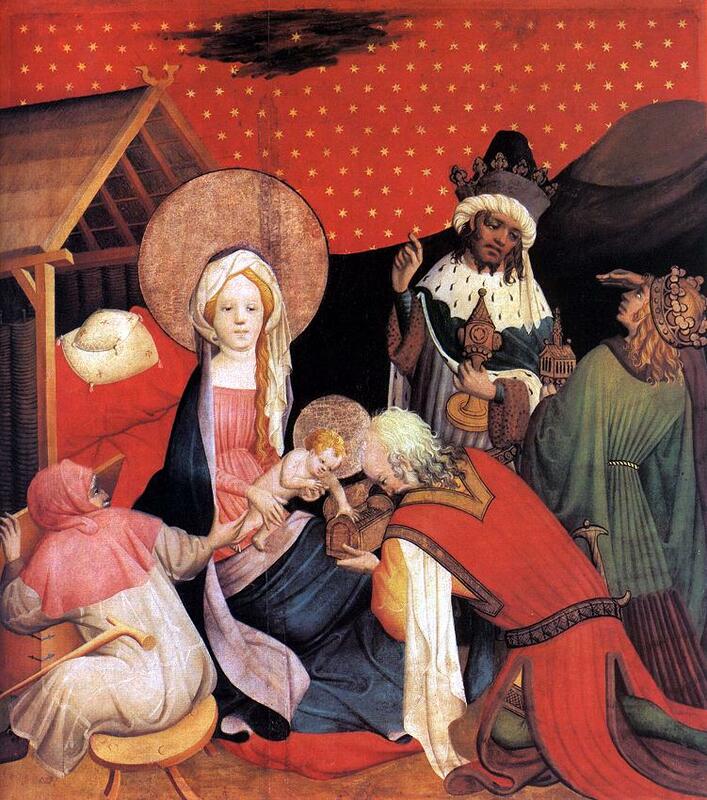 The adoration takes place at night; the magi are guided by a star; the sky is starry in Master Francke’s painting. The magic of the Orient and all its riches are brought by the magi. The search for contrasts between the poverty of the scenery and the magnificence of the worshippers. 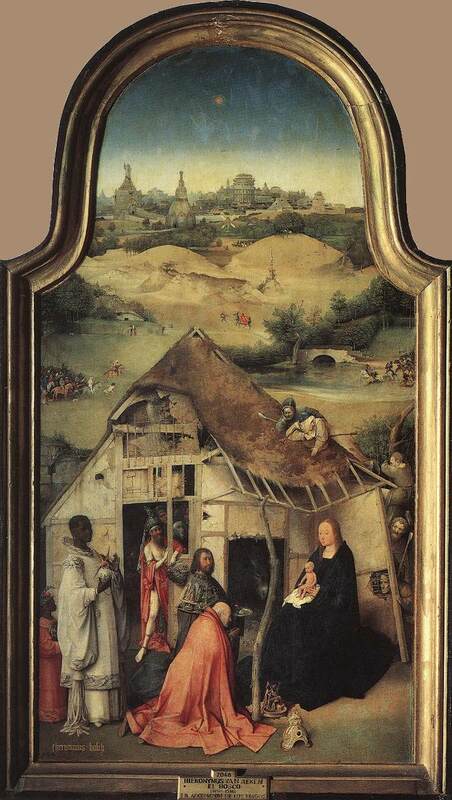 The Adoration of the Magi; Hieronymus BOSCH; 1510 oil on wood; Prado Museum, Madrid. 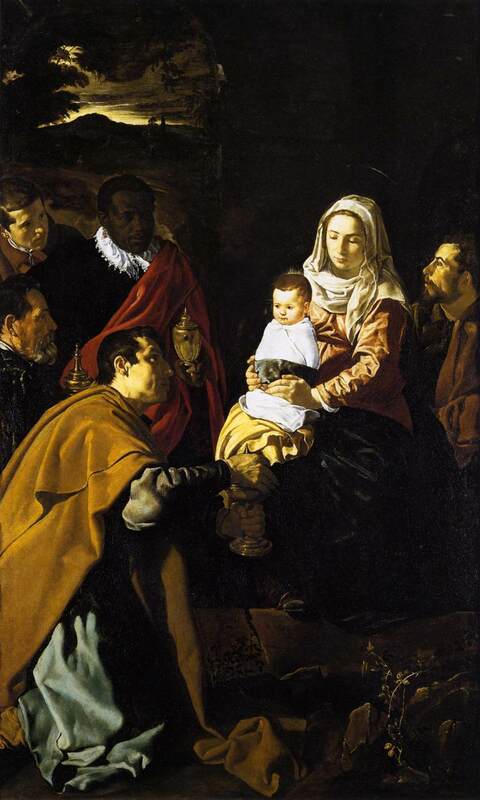 The magi are often placed in a line but some artists prefer a frontal composition. 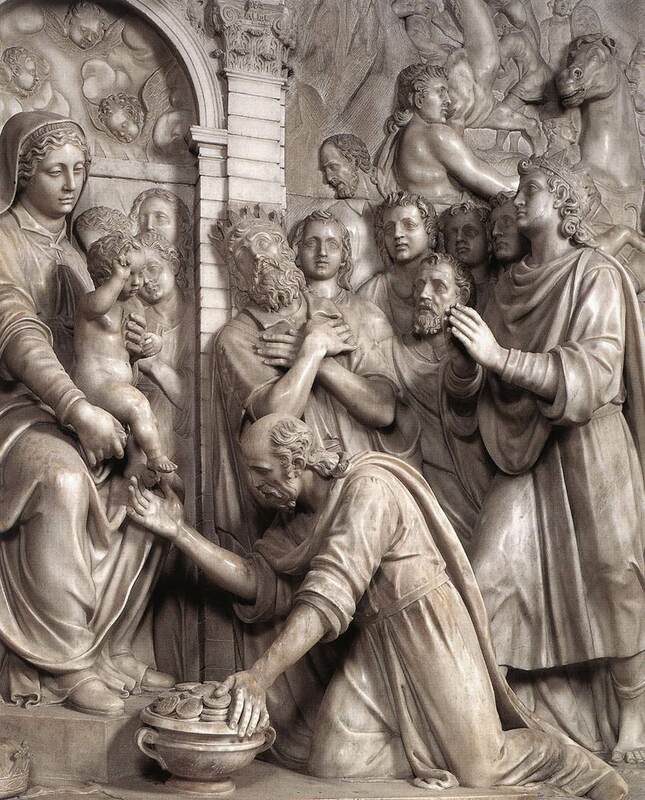 The presence of three characters, with the Virgin or the kings themselves, introduces some dissymmetry sometimes attenuated by Joseph. The Epiphany or the manifestation of God is also an experience of interiority. 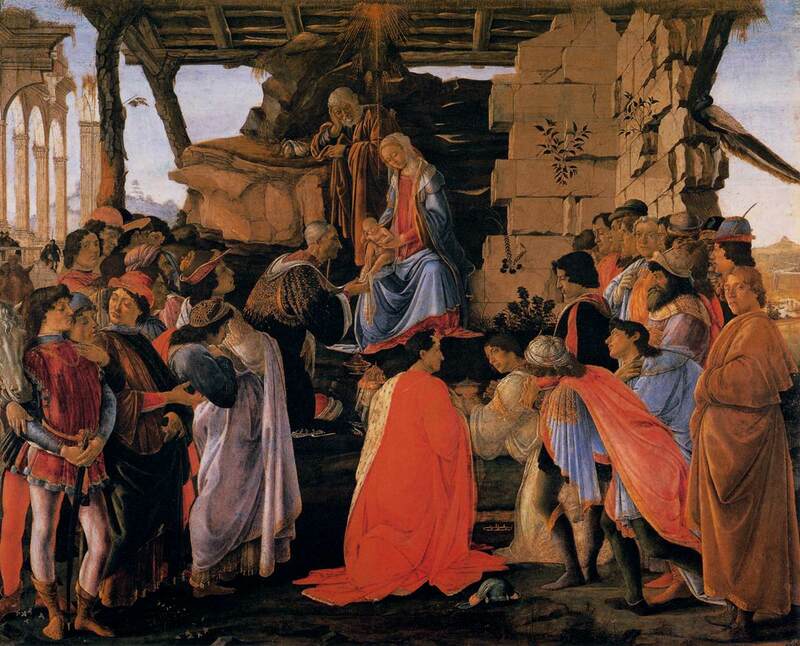 The date of the Epiphany has been fixed on January 6th; it marks the end of a cycle of 12 days or of the twelve nights in England, which begins at Christmas. It is to be noted that for the Christians of the Orient, January 6th is the peak of the cycle. The star of the magi, which can also be understood as a comet, remains in the tradition of the ancients who saw in every new astral manifestation the announcement of an important event. It is closely akin to the legend that claims that a star is born with each individual and that there are good and bad stars. Astrological beliefs are not biblical in any way; they come from the Orient, like the magi, and have known more or less success in the past but nowadays they fare very well. The feast is an opportunity to share the cake of the kings which, in France, has kept the shape of a wheel but according to two recipes: the puff pastry cake in the North of France and the crown brioche in the South. In the old days, the cakes were different in each region. We can see in this tradition the permanence and the christianisation of a Roman feast in honour of Saturn for whom cakes were made with milk and honey. The cake is shared between the guests with still sometimes the poor’s part; then it is distributed according to a precise ritual. A “fève” or bean allows to designate the “king” by lot who is then enthroned and crowned with the shout of “the king drinks”, which gives a carnivalesque character to the feast. The bean was the fruit of the vegetable carrying this name; it was replaced among the rich by a silver coin before a pastry cook used a bean in porcelain around 1870. Since then, small objects in ceramic, then in plastic have been made and, more recently, santons (figures of Christmas cribs), or even the heroes of comics…to the great joy of collectors. In the old days, the “fève” designated the “king of the day” or “king of the bean” and the one who had received it had to offer a new pastry the following day. In this way, gourmands could regale themselves for several weeks or the whole of the month of January! Today, the sale of the kings’ cake remains the best revenue of the year for pastry cooks.